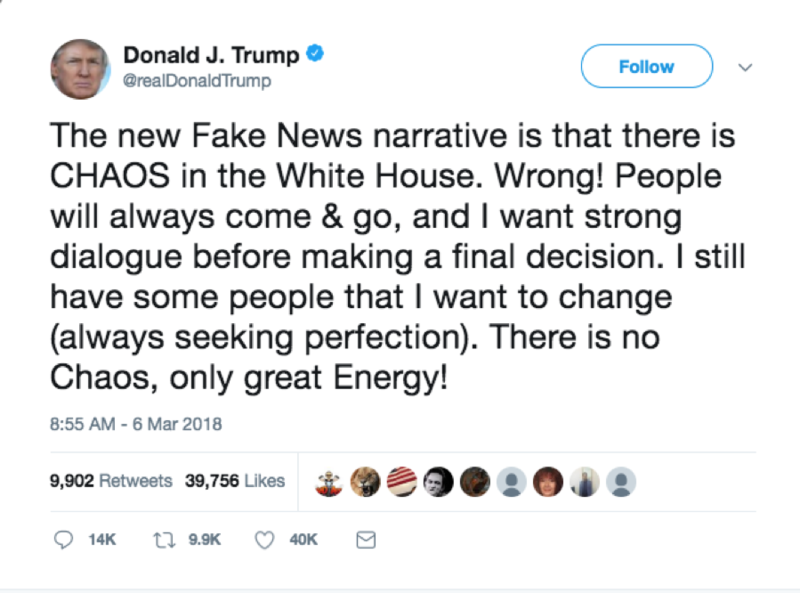 Prior to Saturday’s rally, Trump took to Twitter on March 6 to express his dissatisfaction with the media’s coverage of recent turnovers among White House staff, including the resignations of Communications Director Hope Hicks and Chief Economic Advisor Gary Cohn within the last two weeks, labeling reports “Fake News.” Nineteen members of Trump’s staff have either resigned or been fired from the administration since he took office. Sinclair Broadcast Group, the largest broadcasting company in the country, has recently instructed its stations to denounce “fake news” stories from mainstream media outlets in a promotional campaign. Sinclair has a history of pushing right-wing politics on its affiliates. The company has been criticized in recent months for increasing pro-Trump “must-run” segments on its local stations to nine times per week. A proposed $3.9 billion deal to buy out Tribune Media that would provide Sinclair with an additional 42 television stations, leaving the company with more than 200 news television stations nationwide, has led to concerns about the future of independent journalism in the United States. Members of the press were barred access to Education Secretary Betsy DeVos’ March 7 visit to Marjory Stoneman High School in Parkland, Florida, where 17 people were killed in a mass shooting last month. The Department of Education sent out a press release prior to her visit that stated the school visit was “closed to press out of respect for the students and faculty,” and though DeVos held a news conference following her visit, it abruptly ended after just five questions from the press. This led to criticism from some reporters, including Los Angeles Times editor and reporter Joy Resmovits. Denial of press access has been a common occurrence in the Trump administration. The most recent incident was when White House Press Secretary Sarah Huckabee Sanders threatened to ban CNN’s senior White House correspondent Jim Acosta from future press pool sprays if he attempted to ask President Trump a question during his signing of the National Defense Authorization bill on December 12, 2017. The United States ranks 43rd out of 180 countries in RSF's 2017 World Press Freedom Index after falling 2 places in the last year. For the latest updates, follow RSF on twitter @RSF_en.